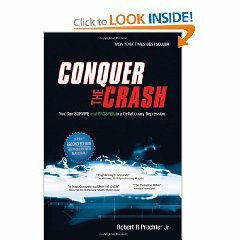 Robert Prechter's original Conquer the Crash book of 2002 sought to explain why he thought the economy was heading for a deflationary depression through the application of elliott wave theory as well as giving many suggestions as to how to protect ones assets in a deflationary environment. The second edition adds 188 new pages (480 pages total) seeking to expand Prechter’s deflationary argument through the stock market’s manic climb to the 2007 peak and subsequent crash. The book has a total of 480 pages and is broken down into three sections or books, with books 1 & 2 as originally published in 2002. This section is 128 pages in length and basically covers Elliott Wave theory as applied to the stock market and economy, presenting the case for deflation as well as several forecasts i.e. for the Dow Jones Stocks Index. This section is 131 pages in length and covers across the board advice on what one should do during a deflationary economic depression i.e. Should you Invest in Real Estate ? Should You Invest in Precious Metals ? What Should You Do if You Run a Business? This appendix appears to promote approx 40 financial services of various types. This appendix comprises extracts from Elliott Wave International's Elliott Wave Theory Market Commentary from 2003 covering the stock market B Wave rally into 2007 (though the Dow did hit an all time high in 2007), and the subsequent bear market. This appendix comprises extracts from Elliott Wave International's Elliott Wave Theorist Deflation Commentary from 2003 which basically covers deflation as a consequence of debt deleveraging credit crunch. Updates the elliott wave price pattern and projection on the Dow 2002 print edition. The first 262 pages are identical to the first edition. Appendix C and D provide an update to the analysis and thought processes behind the unfolding deflationary depression scenario. Appendix E contains Robert Prechter's updated Dow charts. The aim of the book is two fold, a. to bring Elliott Wave Theory to the masses, and b. To forecast the consequences of the unfolding deflationary depression as well as recommending a series of actions to take to help survive the depression. The second edition has sought to update what has subsequently transpired in to 2008 as well as continuing the theme of an unfolding deflationary crash. To coincide with the release of the book, EWI has made available to the Market Oracle readership these 8 free lessons from the book. Learn more, and get immediate access to the 8-lesson "Conquer the Crash Collection" here. I bought Prechter's book when it first came out. His timing is terrible. Always has been - just look him up on the internet. Nadeem Walayat's timing is brilliant. This year alone his performance has been brilliant, and his predictions amazing. Go with Nadeem, not Prechter. In my opinion to produce accurate forecasts, you cannot invest too much in them both in terms of money and psychological, else it will skew the outcome. That and knowing the fact that ANY forecasting skill is NOT necessary to trade, which means the focus has to be on reacting to price triggers regardless of what a forecast / ones best educated guess says.